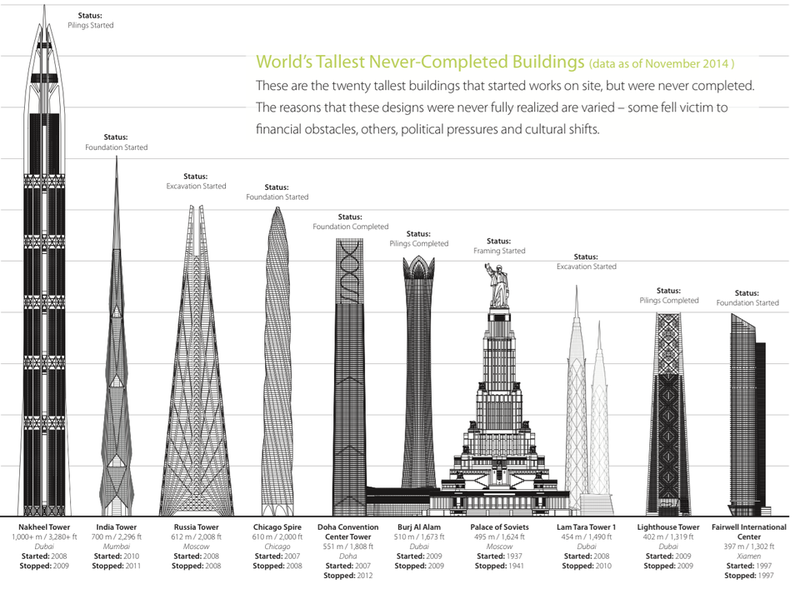 Many buildings never get completed. Sometimes the construction phase burns out the fund, and the bricklayers have to halt. Some other times it is an event, like a war or a political shift, that stops the work halfway. 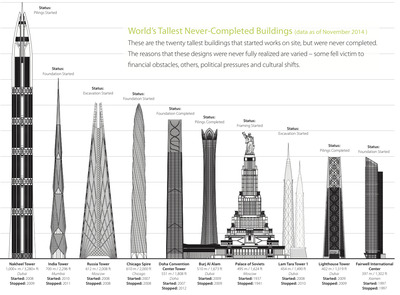 The chart below, published by the Council on Tall Building and Urban Habitat (CTBUH), shows the ten tallest buildings that started works on site, but were never completed. 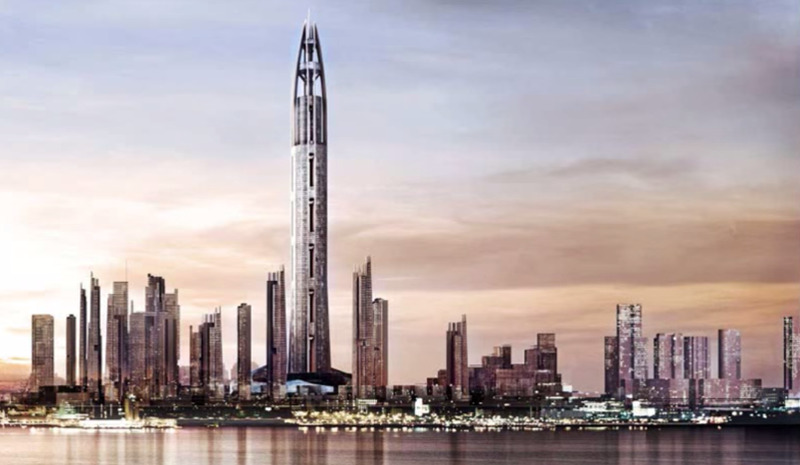 The top spot goes to the gigantic Nakheel Tower in Dubai, which would have to go up as far as one kilometre (3,300 ft). Launched in 2008, it had to be put on hold in 2009 when the builder went bust. The proposed relaunch of the construction never happened, and the building yard is still untouched after five years. 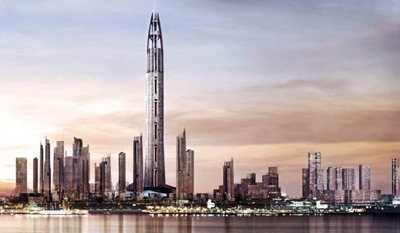 Three more projects that make the list also come from Dubai, with one more from neighbour Doha. Clearly, the Emirates have a passion for tall towers, but sometimes the projects don’t go to plan. The Chicago Spire, the fourth tallest project on the list, also went bust because of the financial crisis, leading to a $US77 million (£49 million) lawsuit against its developer Garrett Kelleher. 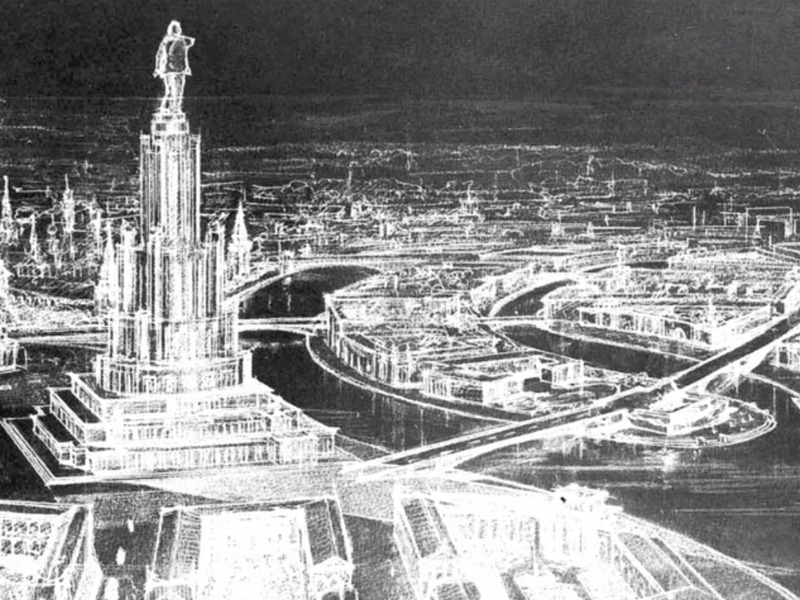 World War II halted the construction of the Palace of the Soviets, a gigantic bureaucratic behemoth that Joseph Stalin wanted to build in Moscow. The dictator himself specifically required that it would top the Eiffel tower in Paris. Started in 1937, it would have been the tallest building on the planet at that time, but the Nazi invasion of the USSR stopped its construction in 1941. Not a bad result, considering that the skyscraper would have been topped with a statue of Stalin himself, overseeing the Russian capital from 450 metres up (image right). The Palace and its creator are also the subject of a dedicated video on YouTube. The more recent Russia Tower, on which construction stopped in 2008 and is now due to become a car park, shows that mega buildings are still much appreciated around the Kremlin. The report concludes that at the moment 50 buildings taller than 150 metres (500 ft) are on hold in the world. How many will make the list next year?